This is for the base game + the Winx Expansion set. Age of Towers brings the exciting gameplay of your favorite tower defense games onto the tabletop! 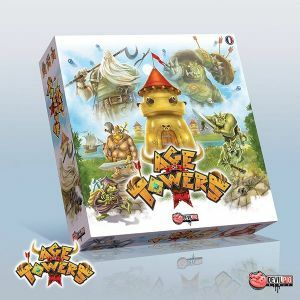 Playable either solo or with up to four players, Age of Towers sees you and your opponents competing to defend your cities against the oncoming wave of monsters by constructing defenses, placing traps, and funneling those beasts towards your opponents' cities! Make a quest (by drawing two cards from the market deck). 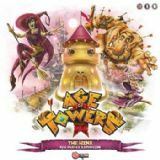 Build a tower, then optionally play a market card. Extend your path, then optionally play a market card. Go to the market by choosing, then playing an available market card. Each monster type has a movement value (1-3 spaces) and maybe a special ability; all core box monsters have 2 life points. The boss, who is not a monster, is harder to kill as it has 10 life points; when a player successfully kills it, the game ends. Each time a monster or a boss leaves your path to reach your city, you lose a number of city guards equal to their movement value. You begin at 15, and even if you lose your last one, you don't lose the game; you will just earn fewer victory points than other players. After the game end, each player adds their victory points from three sources: Number of remaining city guards, amount of damage to your boss, and achievements (which are drawn randomly at the beginning of the game).